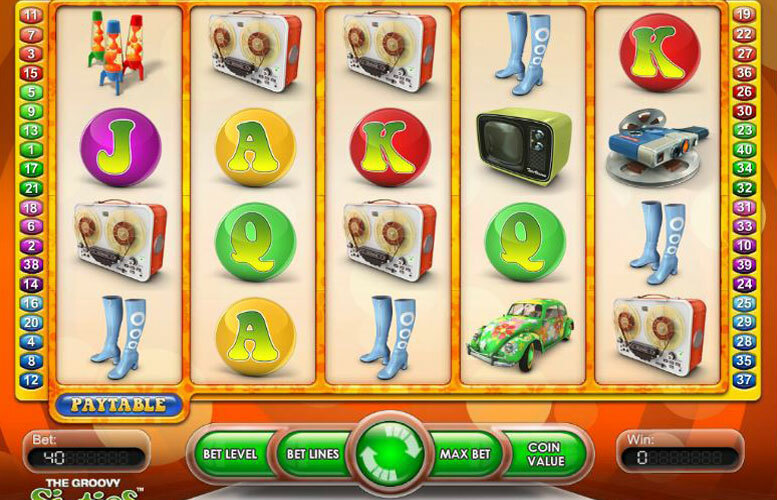 The Groovy Sixties slot offers players 40 paylines across 5 reels. It’s payout percentage is 96.5% and the game offers both wild and scatters which can replace other symbols to help winning comobo’s and trigger free spins where all winnings are doubled! The Groovy Sixties slot game is a real blast from the past, specifically the 1960’s, and features 40 different paylines whilst playing across 5 reels in total. Grooving to the decade of the Sixties, you can reminiscence with the groovy graphics and sounds as you keep spinning the reels. It’s pretty uncommon to see a video slot game with 40 paylines and this has it’s pro’s and con’s. On one hand if you activate all lines then you have a higher chance of nailing a winning comobo but on the other hand it can cost more per spin to play. Lots of staking levels are offered though, more on that later, so you should be able to find your sweet spot. The music is a definite highlight with this slot as the creators have done away with the typical slot music/sound effects and replaced them with matching groovy tunes. Just like the Sixties, the reels of the slot are quite hypnotic with a bright orange background and line markers showing each of the forty play lines. Launched in 2009 by NetEntertainment, it offers players the opportunity of a free demonstration before they can start grooving to the real deal. NetEntertainment has created this retro based slot machine game not just for the Sixties experience but also for multiple winning opportunities. The top jackpot for this game is 20,000 coins and can be won during free spins rounds in which triggering more free spins is possible and winnings are multiplied. From the regular symbols the top payout is 1000 coins, which is possible by getting five of the wild symbols on a selected pay line. 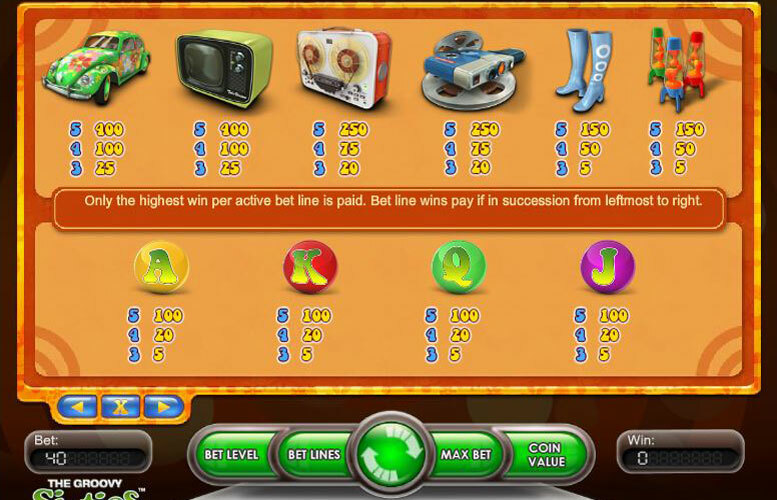 You can play for the jackpot by manually or automatically spinning the reels by using the Auto Play function to set the number of playlines and the number of spins you want to play for. At one point in time, you can play 1, 10, 25, 50, 75, 100, 250, 500, 750 or 1000 spins. The amount that you win when the jackpot lands depends on the coin value you are playing. Obviously the higher the coin value the more you’ll win when any winning combination drops onto a payline. Full info on betting limits for this game is below. You can play for free but you can also use real money and for every play line, you can use 0.01 or 0.50 coins. To get started you first select the number of lines you want to play (ranges from 1-40). You can add the number of lines individually, using the Bet Lines button at the bottom of your screen, or by clicking the symbols of the bet lines. You then select your coin value and following that choose from between 1 and 5 bet levels. The total bet that you place is displayed on the left of the window and if you want to go all out there’s a Bet Max button as well. Once you’re happy with your stakes just hit the Spin or Auto Play button and away you go. Once you win, the winning bet lines automatically become highlighted and you can see what you won at the bottom of the window. The min possible bet is 1 coin while the max is 200. This is the most important icon and it is also the wild which basically means that it can replace any other symbol. It cannot however, replace the scatter icon that works on its own. It’s also important to note that if you spin in multiple wilds on different reels then they can line up to create stacked wilds. 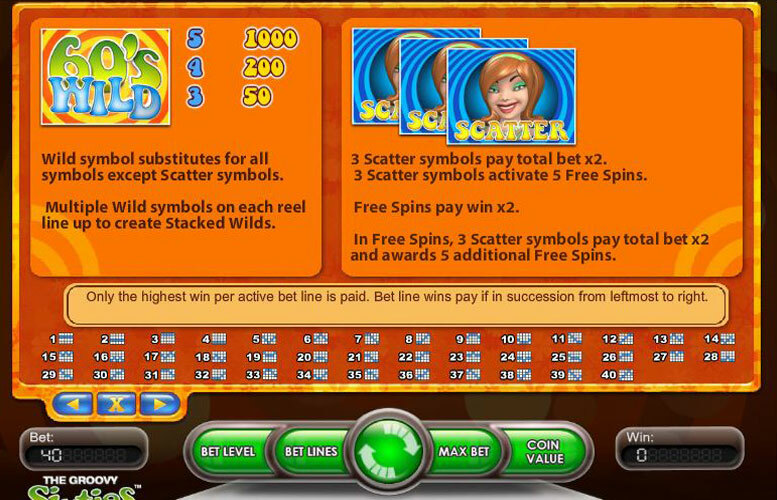 The scatter is the groovy chick and if you get three of these chicks on the reel, you can get a 2X win multiplier and five additional free spins. Other than the wild, you will come across the Sixties bug, the reel to reel tape recorder, the Sixties television, Sixties Go Go boots, Ace, King, Queen, Jack, Lava Lamp and a Sixties home movie camera. All of these symbols are a sweet recollection of the Sixties, supplemented by a music theme that offers a pleasant break to slot machine players from the typical boring tunes. However, the game has no progressive jackpot and does not have a bonus game either. It’s a solid slot but it could be improved. This game has a rating of 3 / 5 with 214 total reviews by the users.